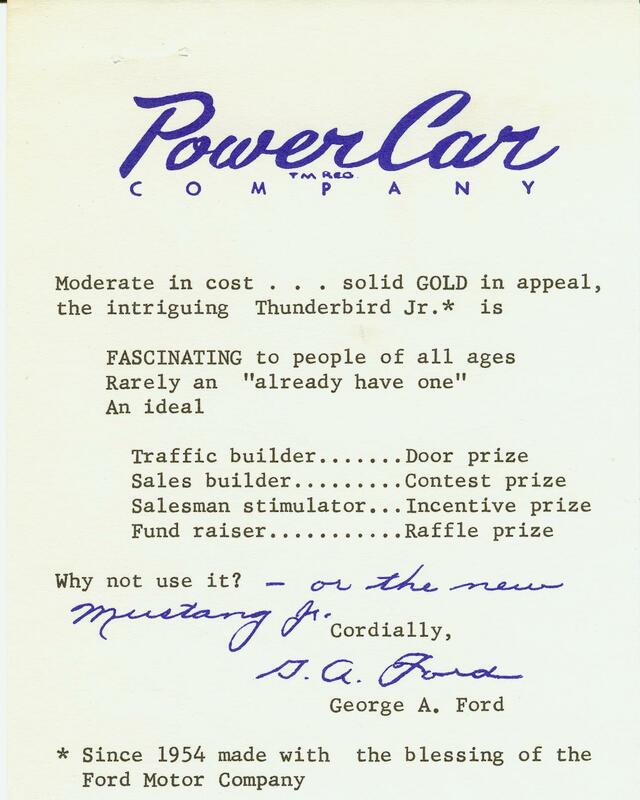 After making Thunderbird Juniors since 1954 when the first 1955 Thunderbird was introduced it was only natural that they started making the Mustang Juniors in 1964 in conjunction with the introduction of the new Ford series and continued with styling changes through 1967 just like the full size cars when the Powercar company went under. 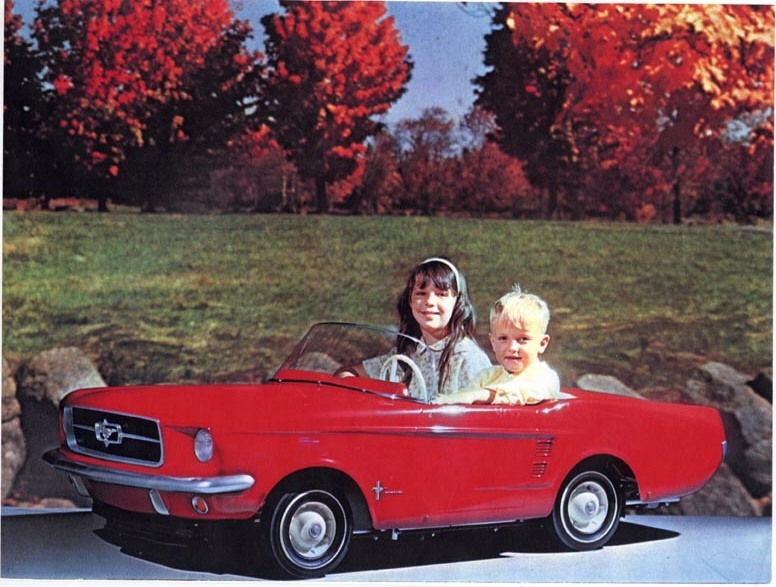 According to the interview done with George Ford (no relation to Henry) in 1990 they made just over 600 Mustangs in all of the years and models Starting with serial number 1 in 1964. 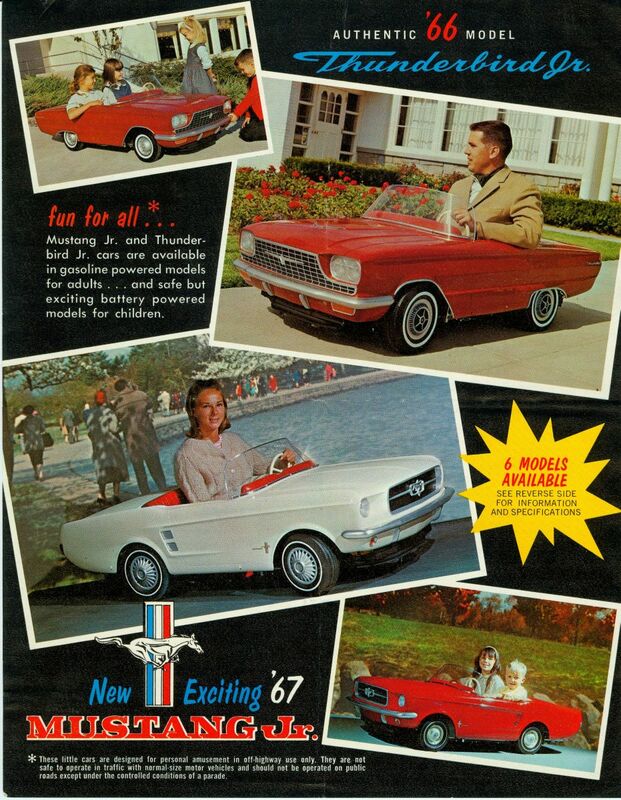 I used to own a 1967 Gas powered adult fun version that was one of the last produced (serial #611). 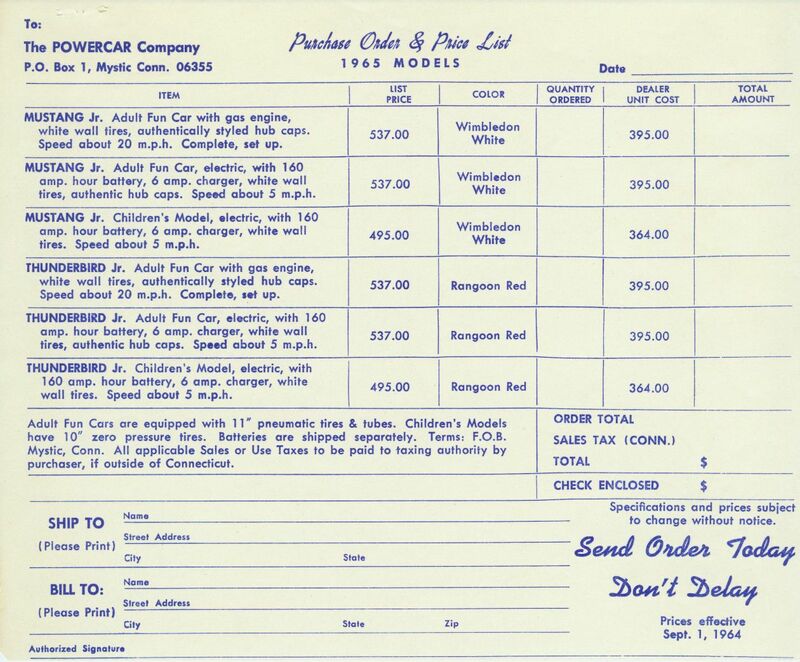 there were three models available. the bottom of the line was the electric powered kids version. 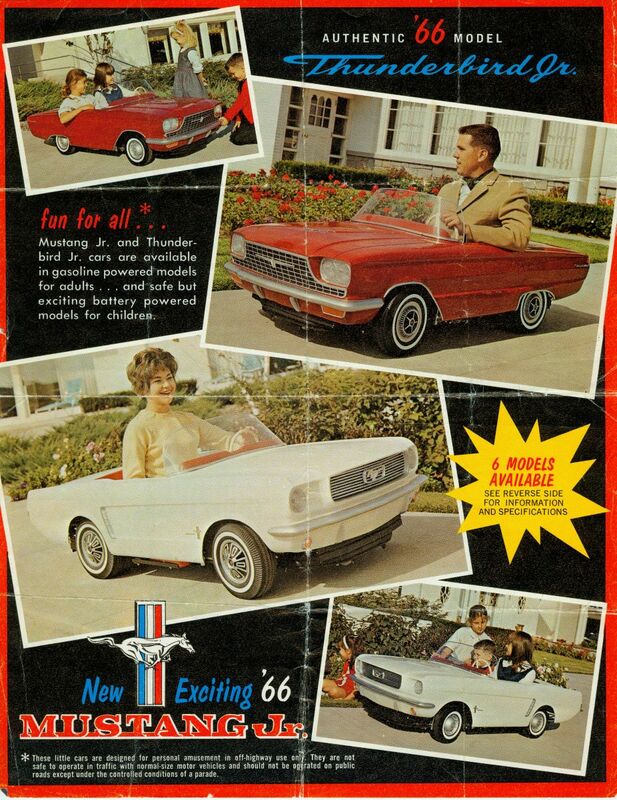 next was the electric powered adult version, and the top of the line adult gas powered version. all of them used the same body but the adult versions had larger axles and Phneumatic tires. adult versions even had hubcaps! They were given away in promotions and sold to those that could afford them. Many have met their fate at the hands of inexperienced drivers through the years so finding one today is a tough job to do. 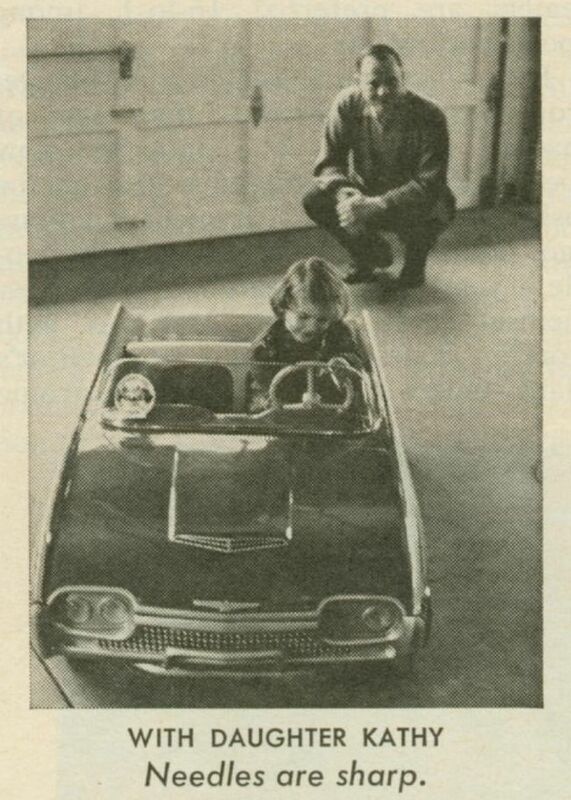 In the April 17, 1964 issue of Time Magazine with Lee Iacocca on the cover his daughter is pictured in the article behind the wheel of a 1963 Thunderbird Junior do you think she got a 65 Mustang junior also? 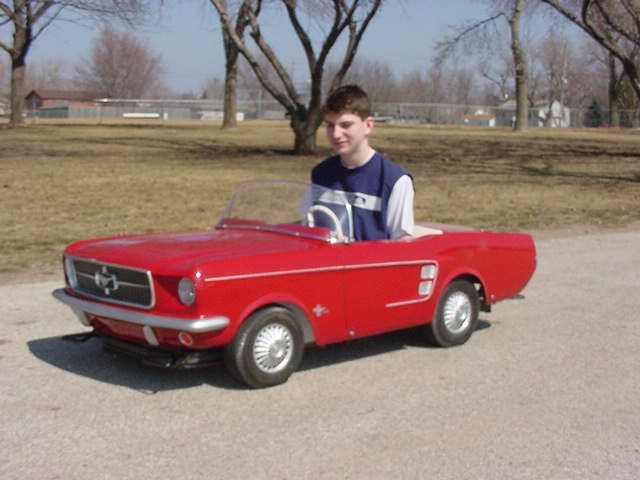 The 67 Gas powered Mustang Junior I used to own was originally purchased by a shriner for use in parades, it carries some unusual options like faux rear view mirrors and a shriner special factory installed "frame handles" that attached to the frame so the cars could be loaded and unloaded without damaging the bodies. In order to restore my car I had to make a number of parts that could not be found. I have kept the molds and will be able to provide replacement parts for other mustang owners. (some parts fit thunderbirds also!) go to the resouces page to find the list. the statment they used on the 1967 brochures says it best! 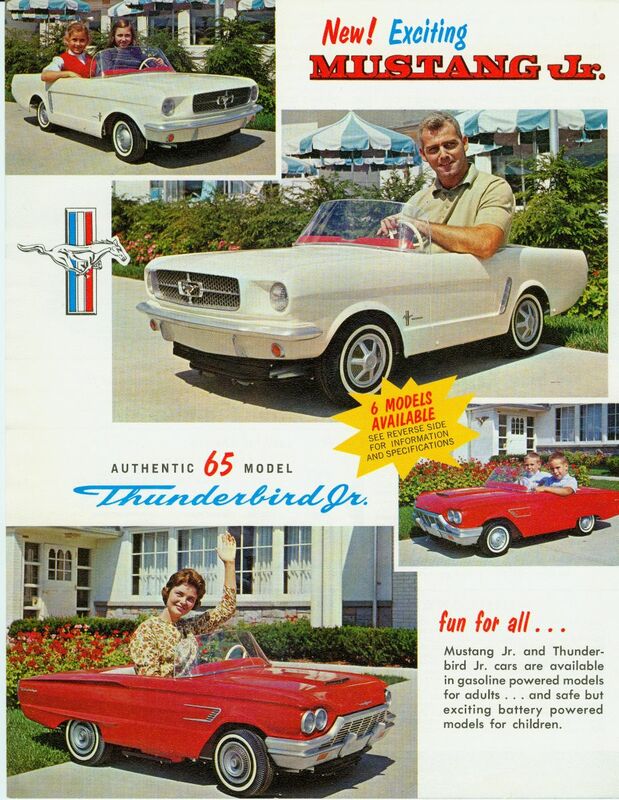 "Thunderbird Jr. cars have been made continuously since 1954 (with the cooperation of the ford motor company) with the arrival of the Mustang in 1964, the Mustang Jr. joined the family. 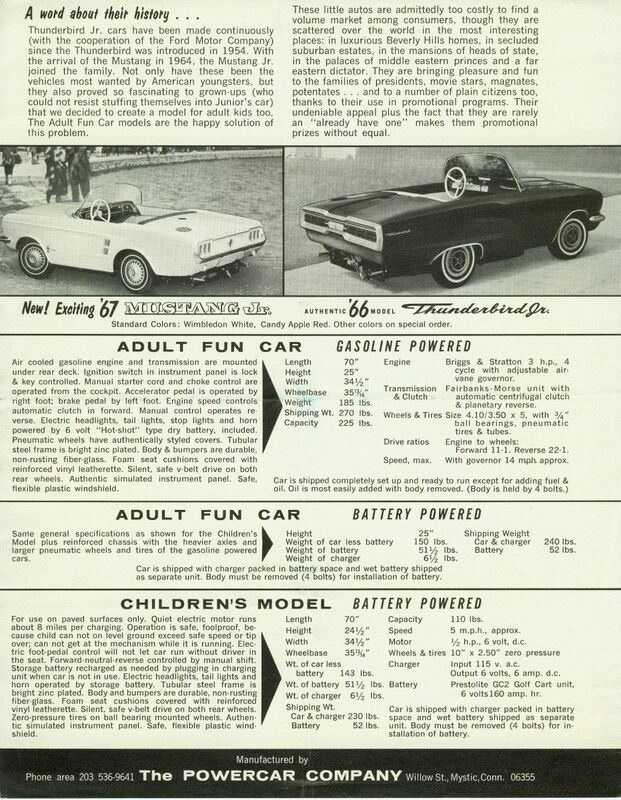 not only have these been the vehicles most wanted by american youngsters, but they also proved so fascinating to grown-ups (who could not resist stuffing themselves into Junior's car) that we decided to create a model for adult kids too. The adult fun car models are the happy solution of this problem. These little autos are admittedly too costly to find a volume market among comsumers, though they are scattered over the globe in the most interesting places: in luxurious Beverly Hills homes,in secluded suburban estates, in mansions of heads of state, in the palaces of middle eastern princes and a far eastern dictator. they are bringing pleasure and fun to the families of presidents, movie stars, magnates, potentates... and to a number of ordinary citizens too, thanks to thier use in promotional programs. thier undeniable appeal plus the fact they are rarely an "already have one" makes them a promotional prize without equal." 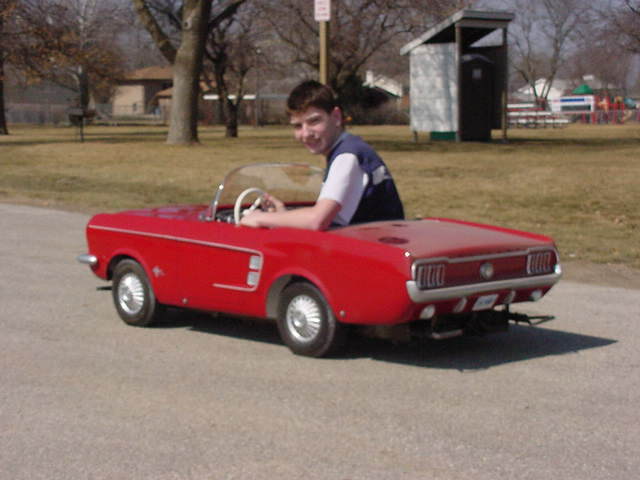 Old home movies on Youtube of my 1967 gas powered Mustang JR! rear of my old 67. 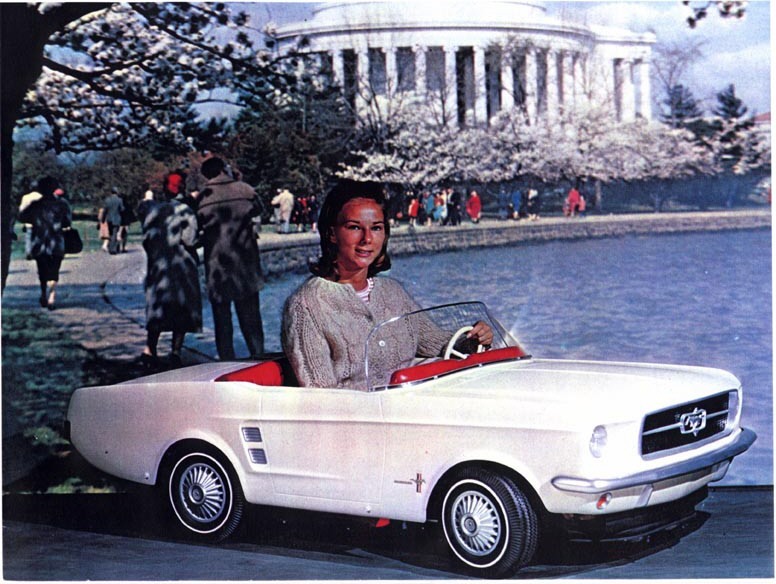 Specifications for the 1965 Mustang JR are as follows. 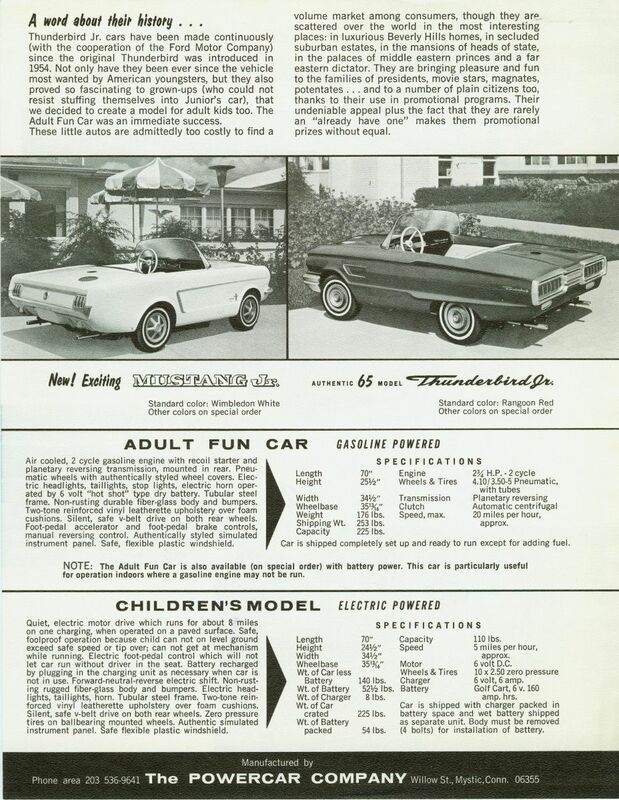 Specifications for the 1966 Mustang JR are as follows. 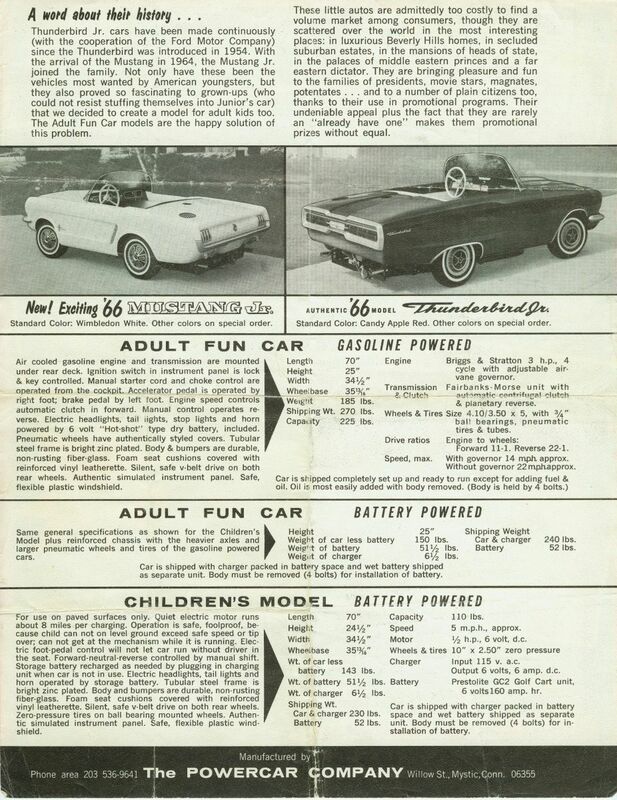 Specifications for the 1967 Mustang JR are as follows.